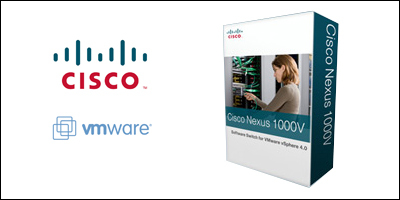 Cisco Systems is making its virtual switch, the Nexus 1000v, a little less virtual. The Nexus 1000v virtual switch replaces the vSwitch embedded in VMware hypervisor software and aims to give network administrators more control and visibility into the switching that takes place between virtual machines on a virtual host server. To date, however, the Nexus 1000v has existed as a virtual machine — a turn-off for network administrators who are accustomed to being able to see and touch their physical network devices. Cisco and EMC this week unveiled their anticipated collaboration, which will provide integrated products and services for customers building private cloud computing infrastructures. 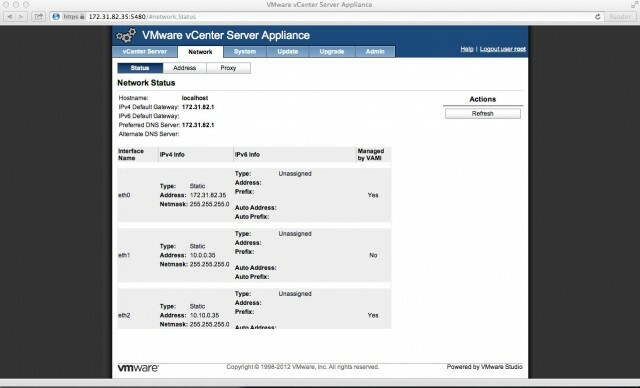 The partnership, which also includes virtualization software vendor VMware, is set up in two parts: one is a Virtual Computing Environment coalition to develop the new products; the other is a joint venture, called Acadia, to train customers and partners on how to install and use the products. Cisco and EMC are lead investors in Acadia, while VMware and Intel are minority investors. Acadia will have its own CEO, which the companies are searching for, and an initial staff of 130. Acadia’s main mission will be to accelerate product sales and deployment, perform initial operating and then transfer operations to customers or partners. “It will be a repository of knowledge transfer and best practices,” said EMC CEO Joe Tucci, during a Webcast announcing the coalition and joint venture. The collaboration between the three companies is targeting a market the companies say — citing data from McKinsey and Company — exceeds $350 billion annually. Half of that amount is spent on capital expenses — product acquisition — and half on operating expenses. Roughly 70% or more of those costs are allotted to maintaining existing infrastructures, leaving 30% or less for new technology purchases. The companies also say that approximately $85 billion can be addressed with data center virtualization and private cloud technology by 2015. Every now and then, all network engineers have to deal with some kind of network attack. Usually, the attack does not target the network devices, but the machines that provide services (e.g. www, database hosting…), because it’s more easy to find on the Internet a script that is probing port 80 for example, which by the way any kiddie can use, than to corrupt BGP in order to act as man-in-the-middle. 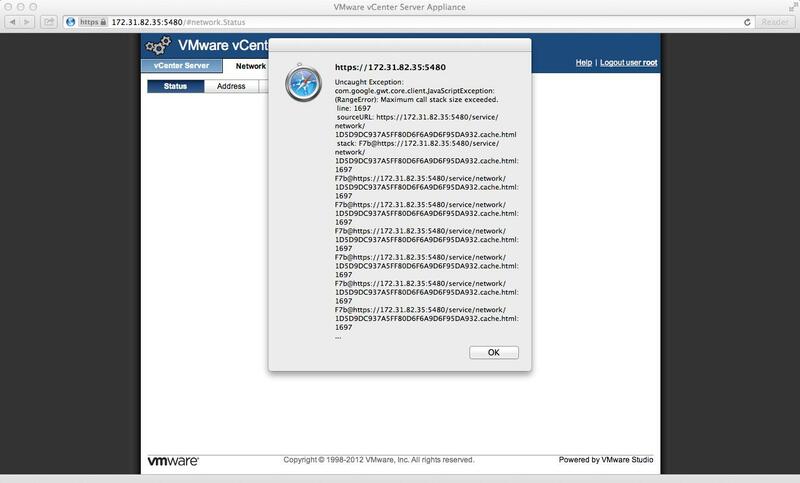 Anyway, in front on the machine being attacked, there is a network device and even if the network component is not the target it can be affected (e.g. 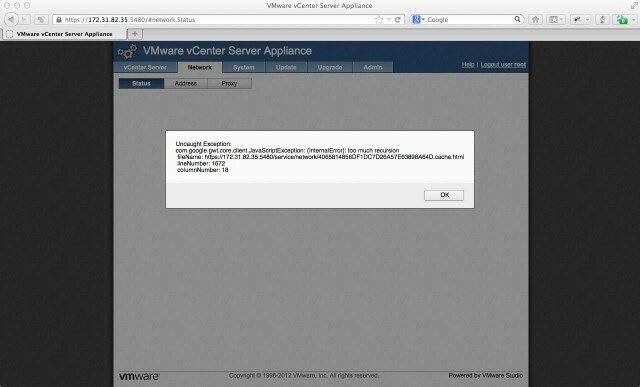 high traffic encounter during a denial-of-service attack). So, beside the fact that we have to protect the network components, we have the duty (at least moral) to help the team that is managing the servers to mitigate the attack. For those of you who are not familiar I will explain shortly what is a Denial-of-Service (DoS) attack. A denial-of-service attack (DoS attack) or distributed denial-of-service attack (DDoS attack) is an attempt to make a computer resource unavailable to its intended users. DoS attacks typically target sites or services hosted on high-profile web servers such as banks, credit card payment gateways, web hosting and so on. One common method of attack involves saturating the target machine with external communications requests, such that it cannot respond to legitimate traffic, or responds so slowly as to be rendered effectively unavailable. This extreme external communications requests can be achieved using ICMP flood, peer-to-peer attack, teardrop attack, nuke, application level floor and many other (too many…) methods and the purpose of this is the consuming of resources on the target machine so that it can no longer provide its intended service or obstructing the communication media between the intended users and the victim so that they can no longer communicate adequately. On method to prevent DoS attacks is to limit on the network device ( network router) the amount of connection which is allowed to pass to a server by using TCP Intercept. The TCP intercept feature helps prevent SYN-flooding attacks by intercepting and validating TCP connection requests. 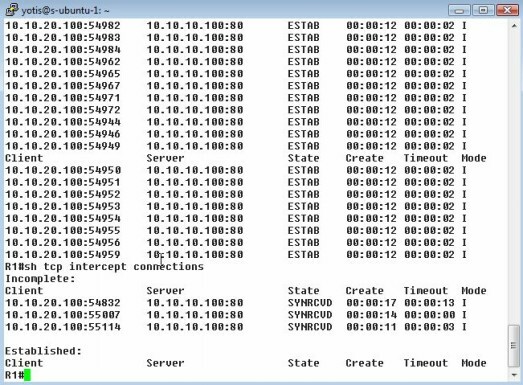 In intercept mode, the TCP intercept software intercepts TCP synchronization (SYN) packets from clients to servers that match an extended access list. The software establishes a connection with the client on behalf of the destination server, and if successful, establishes the connection with the server on behalf of the client and knits the two half-connections together transparently. Thus, connection attempts from unreachable hosts will never reach the server. The software continues to intercept and forward packets throughout the duration of the connection. The TCP intercept can operate in either active intercept mode or passive watch mode. The default is intercept mode. In intercept mode, the software actively intercepts each incoming connection request (SYN) and responds on behalf of the server with an ACK and SYN, then waits for an ACK of the SYN from the client. When that ACK is received, the original SYN is set to the server and the software performs a three-way handshake with the server. When this is complete, the two half-connections are joined. In watch mode, connection requests are allowed to pass through the router to the server but are watched until they become established. If they fail to become established within a definite interval, the software sends a Reset to the server to clear up its state. Some explanation for the line above. We create an access-list matching the traffic from anywhere to the Server. We set the TCP intercept mode to intercept (this is not need actually, because it’s the default mode; I put it here just for the sanity of the example). When the connections are over 150 (…max-incomplete high 600) the router will start to drop connections starting with the oldest ones (..drop-mode oldest). As soon as the connection will be under 100, the router will cease to drop the connections. This are just values used for this example. To check a live example of what you should see if your TCP Intercept configuration is working properly please click on the image below. The test is done in Dynamips environment with 2 VMware machines (client and server) using Ubuntu and a Cisco 3640 series router.